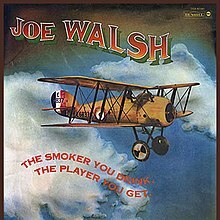 The Smoker You Drink, the Player You Get is the second studio album by the American singer-songwriter and multi-instrumentalist Joe Walsh. The album was released in 1973, on the label ABC-Dunhill in the United States, and United Kingdom, and it was also released on Probe Records in Germany. It proved to be his commercial breakthrough, largely on the strength of the Top 40 hit single, "Rocky Mountain Way", which helped propel the album into the Top 10. On this album, Walsh shares the vocals and songwriting with the other three members of Barnstorm: drummer/multi-instrumentalist Joe Vitale, bassist Kenny Passarelli, and new member, keyboardist Rocke Grace. As a result, a variety of styles are explored on this album. There are elements of blues, jazz, folk, pop, and even Caribbean music. The title is a play on words "The higher you get the better you play!" After the success of this album, Barnstorm disbanded, and Walsh continued making albums as a solo artist. The cover art for the album features a British Sopwith Snipe fighter with French colours, that appears to be flying upside down (sky blue is at the bottom; brown ground is at the top). Writing retrospectively for AllMusic, critic Ben Davies wrote of the album "Walsh's ability to swing wildly from one end of the rock scale to the other is unparalleled and makes for an album to suit many tastes... [it] features some of the most remembered Joe Walsh tracks, but it's not just these that make the album a success. Each of the nine tracks is a song to be proud of. This is a superb album by anyone's standards." In addition to the usual 2 channel stereo version this album was also released in a 4 channel quadraphonic edition on LP and 8 track tape. The quadraphonic LP is encoded using the QS Regular Matrix system. Audio Fidelity reissued a limited 24-karat gold edition CD in 2009. This was followed in 2011 by a reissue in a Japan with a miniature replica of the original sleeve in the SHM-CD format. All songs written and composed by Joe Walsh, except where noted. Different versions of the album have various spellings for two of the tracks. "(Day Dream) Prayer" is spelled "Daydream (Prayer)" on the CD versions, and "Book Ends" is spelled as "Bookends" on some other releases. ^ a b Davies, Ben. "The Smoker You Drink, the Player You Get > Review". Allmusic. Retrieved July 9, 2011.